Shark Cage Diving, Great White Shark Jumping, Air jaws in Gansbaai. Experience a two hour Whale watching trip in Walker Bay, South Africa's Bay of the Whales. During this trip you will often see whales, seals, sunfish, various seabird species as well as the possibility of the Great White Shark and some dolphins. Thousands of Southern right whales migrate from the colder Antarctic to the warmer, sheltered waters of the South African shores. Watching these gentle creatures sunning themselves or breaching is something not too be missed. 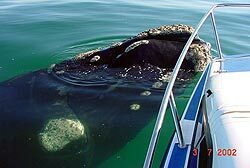 Southern Right Whales can usually be seen from the shore, but seeing them right next to the boat is a more exciting experience. Boat based whale watching trips operate from Gansbaai harbour. All trips are led by whale guides. They were easy for whalers to hunt because they are big, slow and float when they are killed. A whale's weight varies from 50 - 60 tons. The right whale can be identified from other whales by it "V" shaped blow and growths (callosities) on the heads. Calves are born able too swim. South Africa is one of the best places on Earth for whale watching – whether it is land-based or from the water. The best time is winter (May-October), when the southern right whales arrive in South African coastal waters on their migration from Antarctica and remain until November. We also see the shy Bryde’s whale from time to time deeper in False Bay – as well as an array of other marine life including, birds, dolphins, penguins and seals. Gordon’s Bay, which is situated in the northeastern corner of False Bay, is one of the destinations for these gentle giants and we will take you for close-up views of these magnificent mammals. The boat is ideally situated for lengthy whale watching, as there is a fantastic viewing platform perched high above the aft-deck offering uninterrupted views. If the weather turns nasty, guests can move inside to the saloon for warm and dry whale watching. 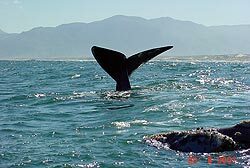 We will take you into False Bay, on half, full or more days, to enable you to gain the best whale watching experience on the Southern African coastline. The whales, traveling in small groups, enjoy frolicking close to surface and are often seen breaching – a sheer joy to behold.